19th April 2018: The eagerly anticipated release of The Nicholson, named after Trinity College’s first botanist Henry Nicholson (1660-1723), is now confirmed offering the very best of modern lateral living in the heart of Ballsbridge, Dublin 4. 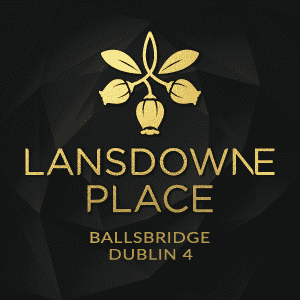 Following on from the successful launch of four phases of apartments at Lansdowne Place, that are substantially sold out, the latest release of 22 spacious apartments and penthouses are now on sale in Ballsbridge. The release of the Nicholson introduces 18 large apartments ranging in price from €800,000 to €2.3 million to include the much sought after and sizeable two-bedroom plus study residences providing particularly spacious accommodation ranging from 1,910 sq. ft. to 2,076 sq. ft. In response to the increasing demand from potential buyers for larger apartments, the Nicholson was remodelled internally to provide more expansive accommodation to meet the demand from purchasers. Three penthouses in the Nicholson and one in the Hutchins are also on release. Believed to be the largest penthouse ever offered on the Irish market, the Nicholson houses a four-bedroom plus study measuring a total of 7,700 sq. ft. of internal and external space. The internal space in this penthouse measures 4,240 sq. ft. with further external terraces of 1,970 sq. ft. conveniently situated off the living accommodation and enjoying a southerly aspect and a large private rooftop garden with 360-degree views which adds a further 1,490 sq. ft. of open space. Priced at €7.5 million this level eight penthouse, the largest apartment in the Lansdowne Place development, offers a unique and rare opportunity to own a property of unrivalled quality, in a premier location. It was reported that a smaller roof garden penthouse measuring 5,700 sq. ft. located in the Blake with frontage onto Lansdowne Road, achieved a price of €6.5 million after being released on the market last September. Within the 215-apartment scheme there are twenty-four penthouses varying in layout and size of which nine have been released and sold to-date. A roof garden penthouse in a second building, the Hutchins comprises a three-bedroom penthouse with uninterrupted views to the front of the sea and the AVIVA stadium and the landscaped gardens to the rear. It measures a total of 4,565 sq. ft. of internal and external space with the internal floor area extending to 2,405 sq. ft. and terraces situated off the living space adding 475 sq. ft. and a further private roof terrace of 1,685 sq. ft.
An exceptional first-class hotel development will be located adjacent to Lansdowne Place on Pembroke Road, comprising 211 guest bedrooms over seven floors. 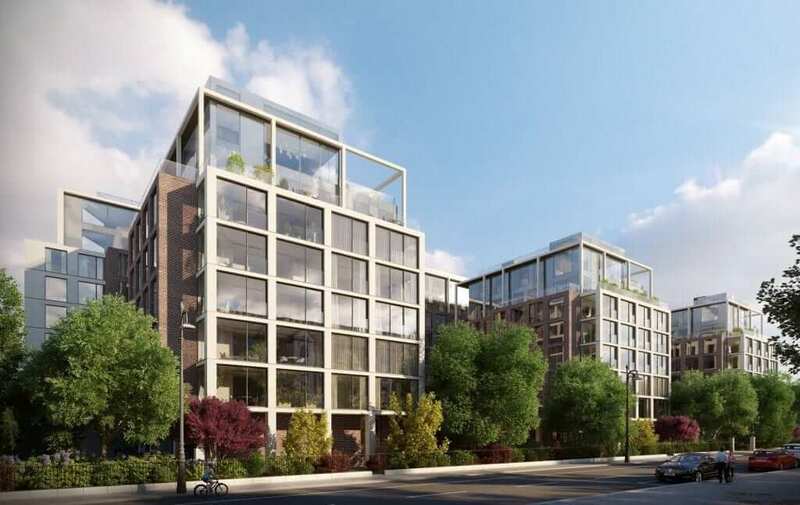 The desirable property will be the centerpiece of a new vibrant quarter in Ballsbridge within a residential-led development with high-end retail and fashion boutiques along with premium food and beverage offerings creating a new village in Dublin 4. 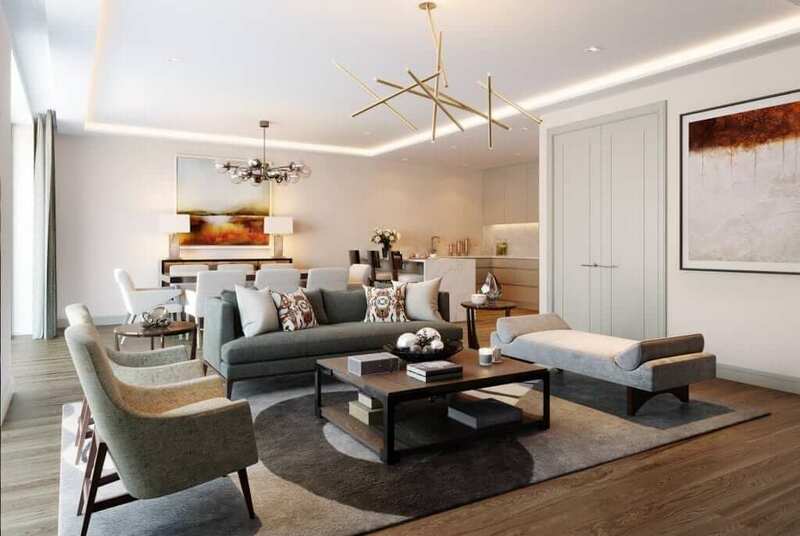 Lansdowne Place offers luxurious modern living inspired by London based interior architects, Goddard Littlefair, and is their first residential project in Ireland. The bright and spacious apartments are characterised by their open plan living areas. Unique features include spacious sunrooms that combine the beauty of outdoor living with indoor comforts, positioned to optimise light throughout. Every detail has been carefully considered, from the custom designed Irish craft integrated kitchens, to the entrance halls, coffered ceiling lighting in the living rooms and bathroom suites finished in limestone and marble. The overall design of Lansdowne Place compliments the existing streetscape of Ballsbridge and creates a luxury scheme offering an abundance of daylight and generous views whilst achieving the necessary degree of privacy for its occupants. Of the units on offer in the current sales phase comprising 3 one-bedroom apartments, 15 two-bedroom apartments, some with studies, and four penthouses. Sizes are generous with spacious one-bedroom apartments at 782 sq. ft. and two-bedroom apartments from 1,131 up to 2,076 sq. ft.
One of the main talking points has been the scale and service provided in the Residents’ amenities at Lansdowne Place. The Residents’ amenity offering will be provided over two floors totalling 6,500 sq. ft. and will be managed by a 24-hour concierge and management team including maintenance, security and guest relations. Residents and their guests will have the benefit of a lounge, library, meeting room, cinema and hospitality space including a private dining room. This unique lifestyle initiative, not delivered previously in Ireland, will also house a gym, sauna, steam room and treatment rooms. As part of the offering it is envisaged that a dedicated car sharing service will be available for the exclusive use of the residents. The Residents Amenities will be located within the Templeton which will be the first block to be completed later this year. Purchasers of Lansdowne Place to-date have been attracted by the spaciousness, quality of craftmanship and superior finish of the apartments that are unrivalled in Ireland and compete with the very best of international standards. There are generous ceiling heights of 2.7 m (8’ 10”) and large floor to ceiling windows, sunrooms and balconies in almost every apartment. When it comes to design, every detail has been carefully curated by Goddard Littlefair, Interior Architects in conjunction with O’Mahony Pike, Architects. Lansdowne Place show apartments can be viewed in the impressive, on-site Marketing Suite by appointment through the joint agents, Savills (Tel 01 6181300) and Sherry FitzGerald (Tel 01 6671888).